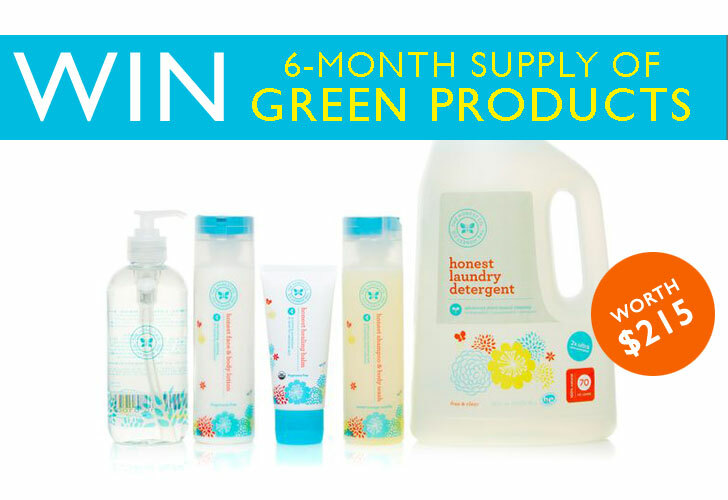 Win a 6-Month Supply of The Honest Company’s Green Cleaning and Care Products Worth $215! Jessica Alba and Christopher Gavigan, former CEO of Healthy Child, Healthy World, recently launched The Honest Company, a new diaper and green product delivery service for eco-minded parents like you. The company offers everything from laundry detergent and hand soap to shampoo and conditioner to biodegradable diapers and wipes – all at an affordable price and effortlessly delivered to your front door. Now we are excited to announce that The Honest Company is giving away a 6-month supply of their Family Essentials Bundle valued at $215 to one lucky Inhabitots reader. The first month will include the five products you see above: Honest Shampoo, Body Lotion, Hand Soap, Healing Balm and Laundry Detergent. But for the other five months, you can choose any five products you like from the entire 14-product body care and cleaning line (shown after the jump) including Auto Dish Detergent, Hand Sanitizer, Sunscreen, Bubble Bath and Surface Cleaner. All products are non-toxic and made in the USA using all-natural and organic ingredients. Read our review to learn more about The Honest Company and keep on reading to find out how easy it is to win! Here’s how to enter to win a 6-month supply of The Honest Company Family Essentials Bundle worth $215.70! 2) Like Inhabitots on Facebook. For extra karma, check out The Honest Company while you’re there. 3) Add a comment to this post with your answer to the following question: What do you look for when buying green cleaning or care products? NOTE: Please be patient – comments don’t appear instantly because they must be approved. Contest ends Tuesday, April 3rd, 2012 at 11:59 p.m. EST. Open to US residents aged 18 and up only. Winner will be announced in our newsletter on Friday, April 6, 2012. Good luck! I just read about Jessica's new venture...I love this. I make sure there is no BPA involved...always bonus points if the green company gives a portion of the proceeds back to a charitable cause! When looking for green cleaners, I check for companies I trust to really provide safe products. I read the ingredients label to make sure there aren't any hidden/unadvertised chemicals that may be harmful. What I look for in cleaning product is a gentle smell. I hate to walk in to a clean room and feel chocked by the smell and feel I am being poisoned. I look for simple and organic ingredients that have the same benefits of other products on the market! I obviously look for natural ingredients ie the scents I make sure they don't have long complicated hard to pronounce ingredients in it and very few ingredients. I have 3 young children and try to keep them as safe as pooible they have health issues and we try to avoid harmful products that might make them sick. One thing I found very nice is using tee tree oil in water to dust furniture it keeps dust away so much longer than anything on the market that I've ever used and it has a nice scent and is totally harmless to my children! Fragrance free and minimal ingredients. I look for products that are affordable, great quality, and they make my family, feel safe, smell good, and happy! Check to make sure it contains no parabens. Safety. I like when the products do their job, are safe for the environment and, more importantly, are safe for my children. My kids love to help me clean (yes, I have photographic proof to show them when they hit their teenage years, ha!) and I love it when I'm able to let them do so. I'm happy to see how far we've come since the age old days of using bleach for everything and I'm excited to see where this "green" thing will go. I look for the least amount of ingrediants and i like to read up about the brand and reviews. What I look for when buying green cleaning or care products are, simple, organic and affordable. I look for pure and natural. Non-toxic, no chemicals, all while still maintaining use. I hate when a company claims to be pure, natural, non-toxic but the product is all runny or not really usable. I look at the ingredients because sometimes things aren't as natural or green as they look like they are. Plus, reviews of the product influence me, too. I look for biodegradable, nontoxic products that don't have any hidden ingredients. I want them to be safe for the environment and safe for my family's health. I look for a label that can be read by the average person. If the average Joe would have a hard time reading an ingredient it is most likely not something I want on mine or my babies skin. I also look for a transparent company. I love that The Honest Company has a support team that is readily available and REAL to answer any questions you have. Automated customer care lines really get under my skin. Honest, Integrity, and quality ingredients. When buying green cleaning or care stuff, I look at the ingredients list. Is it simple, do I know what everything is, does it list "fragrance', are paragons on the label, is there SLS... Thankfully, the Skin Deep database exists since it's impossible to memorize all the bad stuff. I look for a product that has no harsh chemicals. I do not want to worry when my daughter licks the coffee table after I clean it. My son has several allergies, as well as eczema. I look for products that don't have any allergens or harsh chemicals that can harm him. Like you on FB, signed up for the newsletter -- and look for products that don't have harsh chemicals you'll be breathing in while cleaning! I'm so excited to try this! I've been scouring the web and stores for truly toxic free products and it's amazing how many claim to be toxic free and have hidden ingredients! I would be a consumer for life if the honest company is what it really looks like it is!! ( I'm ordering the diapers as we speak :) so happy to finally find Eco friendly diapers!! In addition to saving the planet, green products must have the 3 P's... 1. Performance: It must function to the highest standards, all while making life more convenient. 2. Price: Going green and stacking green are equally important. 3. Packaging: Who doesn�t like pretty things? I try to make sure that the products are really 'green' and not just made to look or sound green. They also have to work well! That they are approved by aan outside agency. I love green products with ingredients you can pronounce and understand, I always look up a product on Skin Deep database before buying. There are so many "natural" products that don't fit the bill! Have to be green and be effective, and priced well. More often than not I like to make my own cleaners and DIY "spa" items :). The first thing that i look in products at the ingredients to be natural and not harmful to the environment and to my body. I replaced all my chemical products with homemade products with natural materials. I would like to see manufacturers recommend natural products that are really natural. I do not care the product has stunning colors and design but the materials is to be made naturally. Spend money to natural materials and not for design! Hello everyone! I believe we must continually produced new green products that include new materials, and manufacturers can not stay stagnant in existing ones. Look around us how much material there remain unexploited in nature! I look for ingredients I know by name and understand (essential oils, vinegar, baking soda, etc). I don't buy anything that I have to "look up" first. I am looking for products that are completely transparent. I want to know what is in each product. I also need them to be working as efficiently as non green products and finally I love green products that also smell 'green'! I have three nosy kitties so I look for products that are pet safe as well as green. I look for natural ingredients, none harmful to pets and small children. I also look for products that offer results without additional package waste. Reusable containers and concentrates help me manage this! I like products that do not have a strong scent, are not harmful to the environment or tested on animals. I look for simple, safe ingredients, but also evaluate whether the procudt does it's job well. I look for products that have ingredients I can easily understand or that only require a little research. A pleasant, non-overwhelming smell and biodegradable, reusable or fully recyclable packaging is also extremely important. The entire package should be able to stand up to the full-circle approach of living, not only offer me a healthy approach to living and cleaning! When I'm shopping for green products, I first check to see what is in them. I look for products that are free of harsh chemicals, VOCs, and most of all anything that has a longer list of cautionary instructions than it does directions for use. I look for products with all natural ingredients. And no harmful chemicals. When buying green cleaning or care products I look at the ingredients making sure that they are true 100% natural products, that packaging is made of recyclable material,and they have a website that you can look at to get more information on what they are about and stand for. What do you look for when buying green cleaning or care products? : What I look for when buying green cleaning/care products is if they are safe for my daughter, aged 18 months, as well as, our puppy, my hubby, and myself. I also look for how a product is made and what ingredients a product contains. Less is more when it comes to truly green products. The least amount of ingredients a product has, the better for us and our environment. I look for products that are affordable, because companies that truly care about the impact their products have on our environment and who go to great lengths to ensure that their products are natural, safe, and sustainably made, will want their customers to be able to afford their products -even if it means they profit less because of it. I look for mostly organic products, because so many products labeled "all natural" or "naturally made", generally, are not very natural at all, which is very misleading. I look for products that come from companies that use a sustainable manufacturing process by using recycled/reused materials for their products, conserve energy and natural resources, eliminate waste, reduce greenhouse gas emissions, reduce water consumption, and make it a constant mission to re-think and reevaluate their products and manufacturing processes to ensure that they are leaving as little of a footprint on our planet as possible. I look for products that come from 'honest' companies, run by 'honest' people, who actually care more about educating people and our youth about why they should use green products, while also ensuring that their products are safe, organic/natural, effective, and earth-friendly than they do about making a profit. These are the things I looks for when buying green cleaning/care products, because it matters. We matter and it's our responsibility to share the message of buying green, natural, safe, sustainable, recycled products, so that we can do our best to reduce our carbon footprint on our planet and take care of our beautiful Mother Earth!! I look for a short list of ingredients with names that I can pronounce. I look for natural ingredients, that there are no pthalates, parabens, or sodium lauryl sulfates. I look fo reputable environmentally conscious companies when buying cleaning supplies. The ingredient list makes me try it, the effectiveness makes me keep it! I look for products that are non-toxic, natural, and safe for use around my children. I also prefer products that do NOT have a strong smell or odor. I have to be vigilant of ingredients of ANYTHING I use - having had Chronic Fatigue Immune Dysfunction Syndrome and Fibromyalgia for 18 years now......"so-called" normal products I used before I got sick now throw me into a crash, which involves sleep, sneezing, and snoring...not necessarily in that order. Babies immune systems can be just as easily affected, so McKinley Alise, born in January, will have nothing to concerned about when she visits us. I look for minimal ingredients with things that I can pronounce, no BPA's and no harsh scents! Affordability! I WANT TO shield my family from harmful substances found in everyday products but if they aren't affordable I simply pass - remembering that my parents and their parents, including all other family members survived these substances. I look for the smell of the product. Jessica Alba said in an article that she put a brown diaper on her baby thinking it was all natural, only to find out it was not....and she had just put a brown diaper on her baby! :) I love that Honest products are natural, but still smell great! I just received my trial of both bundles after reading up on The Honest Company. I have four little girls under the age of six, with the youngest two being twins. I look for truly pure and chemical free products when shopping for cleaners, however, there is most always a HUGE price tag to accompany these wonderful products. I want to keep my family as clean, healthy and natural as possible, so I have begun my journey with The Honest Company... wish me luck! I read the ingredients label to make sure I understand everything that is in the product. What do you look for when buying green cleaning or care products? I'm very picky about my cleaning products. It has to clean well (I've noticed that some products sacrifice effectiveness in an effort to be more green), but it also has to be gentle enough for me & my kids. We all have sensitive skin, and my daughter & I are allergic to most chemical scents. I look for products that are free of fragrance and dyes. I don't like products with ingredient labels that I can barely read. I like products with a good reputation in the green community. Everyone in my family, but me, has sensitive skin, so we have to be careful what we use. I like to look for online reviews of a product before I buy it - like for wipes, how people with sensitive skin reacted, etc, and how well the product cleans as well as how safe it is! I typically don't buy cleaning products, I make my own at home, but it would be most amazing to try out these products and take a break from smelly vinegar concoctions! I look for products that actually work in addition to being green.. I look for certifications, simple non-toxic ingredients, an overall commitment to healthier, safer, and more sustianable products and processes. I look for a short ingredient list with all things I know what they are. If I need a dictionary to decipher the ingredients, I put it back on the shelf! I look for good reviews and truthful product claims when buying green cleaning or care items. I look for a simple,short and recognizable ingredient list. I also make sure that the products are cruelty free and vegan and the package has very little negative impact on the environment. I look for products that are non toxic,no phthalates or parabens or petrochemicals,biodegradable,fragrance free and cruelty free/no animal testing.I sometimes make my own cleaning products using simple household items like vinegar,baking soda,lemon juice to clean with but i do like the convenience of already made products since i'm a busy mommy.I did check out out The Honest Company website and they seem to have great products that are not only safe for families but for our environment as well!? I look for a simple ingredient list and a fresh yet gentle scent as well as recycleable packaging. What I look for in green cleaning products is something that is of course affordable, something that will last a good while, smells good and not perfumey, and something that works great!! I look for an ingredients list composed of non-toxic substances, as well as simple, recyclable packaging. When looking for green cleaning or care products, I look for all-natural ingredients as well as making sure there are no sulfates, and that the product is paraben free. I feel so much better after switching to eco cleaners. I no longer have to use gloves when cleaning and am not worried that my dog or kids in the house will get sick from the chemicals. I look for non-toxic products. I always check for no BPA or Formaldehyde. For me to purchase and use a cleaning product, the ingredients must be listed and must be available to the average consumer. Essentially, with effort, I should be able to recreate whatever cleaning product I would buy. Otherwise, I can't be sure how safe any of it is. I look for cleaning cleaning products with ingredients that I wouldn't be ok with if they came in contact with my child's skin. Especially when cleaning her bathtub, this is really important. If there is a long list of ingredients that are impossible to pronounce, chances are unlikely that I want her taking a bath with them! My little boy is becoming mobile and puts everything in his mouth. I want to know that the products I am using to clean his highchair, toys, tub, down to the floor are safe. Whats the point of cleaning if you are only exposing your family to harmful chemicals? Ban on chemical products, less packaging, and a nice natural smell. I look for the fewest ingredients, nothing with long unpronounceable names and good value for the amount you get. Simple as that! I look for honest and harmless ingredients. Price is a big one too. If I can't afford it, I might as well just make it myself. Biodegradable packaging would be a big one too if I was to buy it! With two little girls and a dog...my husband and I are always looking for cleaning products that are safe and effective to use around all of the wonderful ladies in our lives! To keep everyone safe and healthy is our #1 goal ALWAYS! I get your newsletter and liked both of you on FB as Tofu Fairy! When shopping for household and body items, I make sure I can pronounce and recognize all the ingredients, make sure there are no petrochemicals or animal ingredients, and love it if its organic! When looking for green products, I not only look at the ingredients that are in them, but the company behind the brand. I love to see founders/creators be true to what they believe in and believe strongly in their products. Sometimes companies just make something for the sake of making them and after awhile, people see right through it. Those with a passion and strong belief will continue to make great products that truly are green and safe. This is exactly why I love The Honest Company so much! Thanks for your consideration! I check the ingredients when looking for non toxic cleaners. I also will check out the companies website and see if they are on any of the social media sites I am on. when buying eco-friendly products, i look at if all ingredients are listed and safe for me and my family. i also consider the packaging - minimal is best and cost is always a factor. i love to see more and more enviro friendly products on the market and hope that a shift is happening for more people to become conscious consumers! Something that is gentle for babies!! I have an 19 month and a 2.5 month, and want the best for them!! I check the ingredients first to make sure they are truly green. Then I smell the product, if possible, to make sure I like the scent. The product packaging also has to be nice. I think I'm like most people. I look for a product that not only cleans effectively, but comes at a reasonable price. I like a product that cleans, but doesn't smell like a cleaning product. I want a product that is safe to use around little ones, pets and food. I look at the ingredients and make sure that they are green. I also look to see if the product is organic. I check the ingredients and then the cost. The less toxic, the better. When looking for a product I want to make sure that it is not going to harm my child. I want to make sure that the smell of the product is going to make me feel like opening up a window because it is too strong for me to breath. When I choose products for my son I want to make sure it isn't going to be harmful to him. I also make sure I can be around the product during my pregnancy, but that is limited. First I check to see if the product is made in the USA, I like to support our economy. Second I look to see what the product is made of. I have two boys ages 21 and 4 and we all have terrible allergies. So I usually make sure the prouct doesn't have a heavy scent, and check the color if I can. For some reason red dyes really irritate my four year old. If it's something I buy on a regular basis, I like to research the company. I will gladly pay a little more for a product that is made in the USA and by a compay that doesn't do animal testing. What do you look for when buying green cleaning or care products? When looking for green cleaning/ care product, I make sure that they do not have any chemicals that can harm my future kids and myself because almost everything you put on (make up, perfume, lotion) has some sort of toxin. Especially when it comes to cleaning products. They have strong chemicals that effects outcome of our child when breathing in or even just using it. Eco- Friendly product is what everyone should be using these days. I know I am becoming more Eco- Friendly than ever thanks to the Honest Company. I look for chemical-free ingredients and recyclable or compostable (and minimal) packaging. I like straight forward labels,I like it simple but still eye catching on the purest way. I like it when you instantly see what is eco-friendly, green. I also check the ingredients, I look for natural ingredients, no chemicals. I hate it when I need to google something during shopping just to make sure that I am not buying anything dangerous. And I also try my best to get recyclable items. The smell of some chemical cleaners just kills the vibe in a home. So smell is key for me. I love lavender and citrus smells. I also love knowing that if my child is any where near a green product I don't have to fret. I still keep them out of reach but I don't have to have an empty house just to use them. I am obsessed with finding the safest products possible for my family to include my three nosy cats! I don't like strong smelling cleaning products that make my stomach turn as I try to clean. I just love a fresh clean scent. I also prefer products that are safe for the environment. i don't want any strong scents, especially not chemical ones! I look for products that are good for the planet, that don't test on animals, that are non toxic. Are the bottles recyclable.How much does the product give back to the rainforest. Look at the ingrediants to make sure they are truly natural, as well as the scent! I look for simple, vegan, pronounceable ingredients. I conduct multiple sniff tests on the available scents. I compare prices per ounce with similar products. I agonize over these small decisions! I look for all natural ingredients, the simpler the better and affordable. The first thing I look for is a short and simple ingredient list. I want to enjoy the scent and know that I can pronounce the ingredients! I like to buy from companies that are here in the US, I look for the ingrediants to be sure it does not have anything harmful for my family, animals or our environment, also we have a septic system so we have to be careful of that as well, everything must be recycleable as well. We all must work together to leave behind a beautiful earth for our loved ones. I look for non-toxic ingredients that are safe for my family and the environment. A nice fresh smell is a plus that's not irritating to my husband's allergies. BPA free, fragrance free, and biodegradable. Green products are going to make this world a better place! I look to make sure that they are vegan and as natural and organic as possible. Hello there, happy i discovered your site. It solved the problem to know the topic somewhat improved. I look for BPA free, Fragrance free, & recyclable containers are some of the things I look for. Win a 6-Month Supply of The Honest Company's Green Cleaning and Care Products Worth $215! Jessica Alba and Christopher Gavigan, former CEO of Healthy Child, Healthy World, recently launched The Honest Company, a new diaper and green product delivery service for eco-minded parents like you. The company offers everything from laundry detergent and hand soap to shampoo and conditioner to biodegradable diapers and wipes - all at an affordable price and effortlessly�delivered�to your front door. Now we are excited to announce that The Honest Company is giving away a 6-month supply of their Family Essentials Bundle valued at $215 to one lucky Inhabitots reader. The first month will include the five products you see above: Honest Shampoo, Body Lotion, Hand Soap, Healing Balm and Laundry Detergent. But for the other five months, you can choose any five products you like from the entire 14-product body care and cleaning line (shown after the jump) including Auto Dish Detergent, Hand Sanitizer, Sunscreen, Bubble Bath and Surface Cleaner. All products are non-toxic and made in the USA using all-natural and organic ingredients. Read our review to learn more about The Honest Company and keep on reading to find out how easy it is to win!